As we approach the day formerly known as “Armistice Day,” a little note about Machen’s views of World War I seems appropriate. 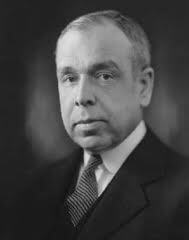 As World War I began, Machen had deep misgivings about American intervention on the side of the British. It appears he was far from a “hawk” on foreign policy. In contrast to the optimistic progressives, professor J. Gresham Machen at Princeton Theological Seminary expressed a more measured view of events in Europe. Like so many of his theological opponents, he had studied abroad in Germany. Yet for some reason Machen’s fondness and sympathy for Germany seemed more durable than that of his liberal colleagues, an attitude all the more striking given his contempt for modernist German theology. In a letter to his mother dated six weeks after the opening of the war, he called Britain’s alliance with Russia and Japan “an unholy thing” that had been fashioned for the sole purpose of subduing Germany, Britain’s “progressive commercial rival.” The idea that this was to be a war for democracy he found manifestly absurd. … Responsibility for the war rested with Britain’s drive for imperial supremacy, he argued, an ambition that deprived Germany of “a place in ocean trade” and actually prevented international peace. This was not a war of ideals, but rather a war of economic competition.